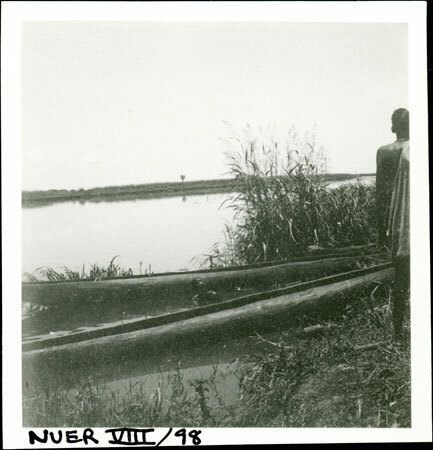 Two dug-out canoes pulled on to the riverbank on the Sobat River, used by the Nuer for fishing. In 1935 Evans-Pritchard spent some four weeks at Mancom village at the mouth of the Nyanding River with the Gaajok and also revisited Yakwach cattle camp further down the Sobat. Note on print reverse ms pencil - "64 4 A176" & print front border ms ink - "NUER VIII/98"
Morton, Chris. "Nuer canoes" Southern Sudan Project (in development). 03 Jan. 2006. Pitt Rivers Museum. <http://southernsudan.prm.ox.ac.uk/details/1998.355.396.2/>.